Have you seen all the Christmas twig decorations? These twig decor projects might inspire you to pick up some twigs on your next walk! Decorating with ice white Christmas twigs, silver, red, or even natural color twigs is easy and very inexpensive. And it’s beautiful! Create a sparkling crystal Christmas, a white Christmas, or a natural Christmas look with twigs. Pick your custom look with your choice of paint color and sparkles! 1. 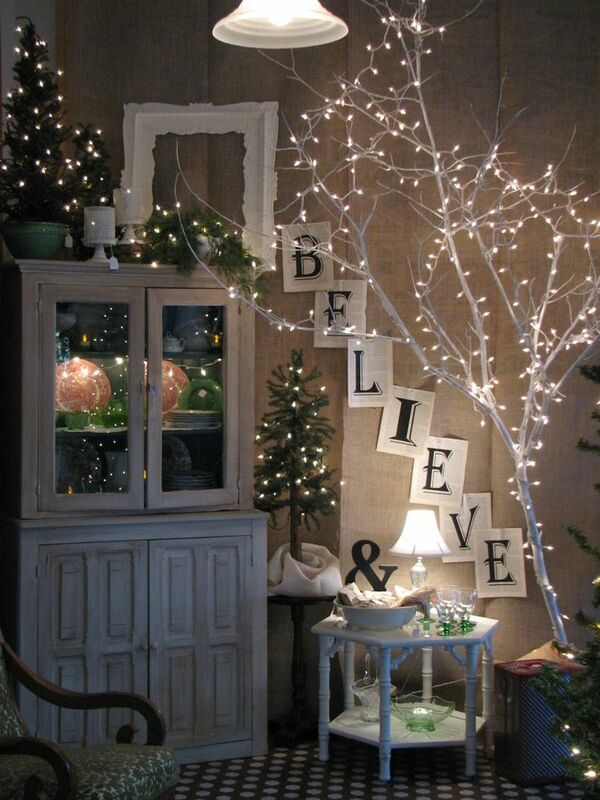 For a simple white Christmas look, paint the twigs white. Add clear glitter or not. 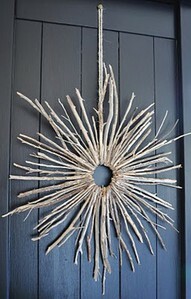 I love the Winter White Twig Wreath shown here. Click here for directions at The Painted Hive. 2, To make it look icy put Aileen’s Tacky Glue (available at craft stores) where you want “ice crystals” to stick to give the look of icy buildup on the branches. Use German glass glitter as the ice crystals, positioning the crystals in the still wet tacky glue. 3. 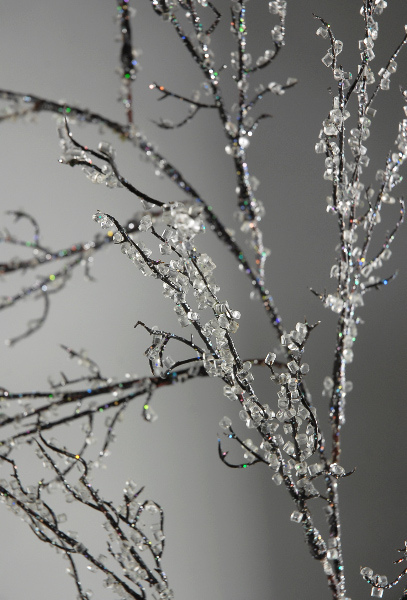 Use Epsom salts instead of the glass glitter to give a frosty look instead of iced branches. 4. Change these looks with different colors of paint. Metallics look wonderful during the holidays, but solid colors look good too. Try glossy red twigs to add color to a wreath or an arrangement of greenery. Or add golden or silver twigs to a bowl of gold and silver ornaments. 5. Add glitter if you like. Try silver spray paint with silver glitter or even hologram-look glitter. Or mix different kinds of glitter to get the look you want. You can use decoupage glue to get the glitter to stick. Click here for an easy recipe to make decoupage glue that is cheaper than store-bought. 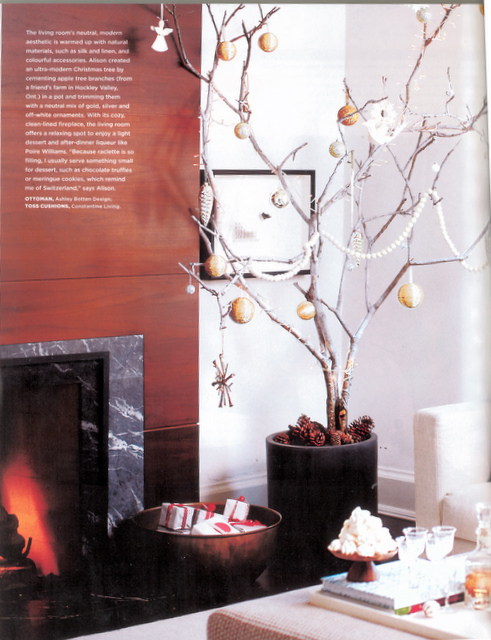 With so many ways to use twigs in your holiday decor, just about any size will work for something. Long twigs or small branches look amazing next to a fireplace, near your front door, or to hang ornaments on anywhere in the house. Add white lights for an icy look at night also. See the end of this post for how to secure branches in a pot. Small twigs can be made into stars to leave natural or paint/glitter, etc. and hang on the tree or at a window. Click here for directions at Cotton Fox which is where I found the photo also. 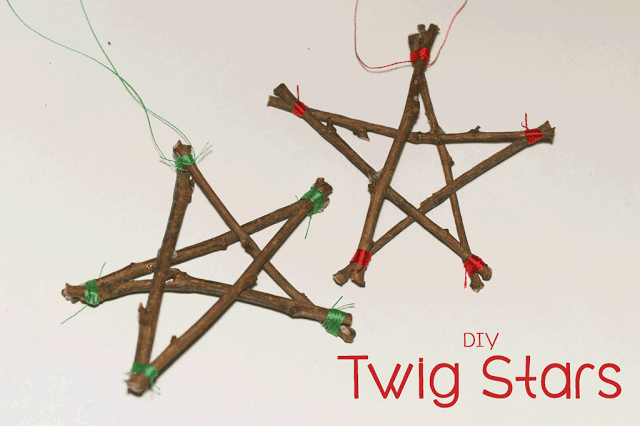 The twigs are tied together for those, but other ornaments can be constructed using hot glue. You can make a heart shape that is filled in with twigs and if you get really good you can make a ball of twigs as an ornament. Again, paint and/or add glitter as you like. I love the little Christmas tree centerpiece pictured here. I’d hot glue twigs to a cone form and then spray paint it and/or glitter it as you wish. Click here for directions at Home Is Where the Boat Is. I think these would be gorgeous in white with clear or hologram glitter. You can also make this kind of little twig tree in flat form for ornaments. Just hot glue the twigs onto cardboard. To get glitter to stick to twigs that will displayed outdoors, spray the twigs with an adhesive like Super 77. Sprinkle the glitter on right after spraying a branch or twig, working with a section of about 12 inches at a time. Put a cookie sheet with sides on it to catch the excess glitter to reuse. If the twig will be indoors all the time you can use decoupage glue instead of the Super 77. Spray painting should be done outside also. I put twigs onto our rock driveway in an area away from the street. Otherwise you can put down newspaper to protect the surface when you spray. For small areas of spraying you can use aluminum foil. When the paint on the foil is dry you might find a use for it in your holiday decor. Maybe to wrap plant pots? Or else just save it to use another time you are painting. Absolutely! Stick the branch or branches in a pot of sand. For a more permanent potted tree you can “plant” branches in a pot by using plaster of Paris or even some insulating foam that comes in a tube. Just hold the painted and glittered branch in place until the plaster or foam is solid. Or use strong masking tape across the top in a grid pattern to hold it until dry. Remove the tape when dry. When dry, you can cover the plaster of Paris or insulation foam with moss, pine cones, ornaments, tinsel, craft marbles, stones, whatever. Even used wrapping paper that you put through the shredder works. I made one several years ago painted plain white. I added white lights and ornaments. It’s great for a lot of different holidays–just change the ornaments. Like these ideas? Click here for 10 more DIY Christmas twig decorations to try! And click here to see how to make small twig trees to use as ornaments, decorations, and more. Your post brought back good memories of the time when we used to make similar kinds of things, though with wooden cones we find our end and leaves – after drying them up a little. We used to have school projects to complete for Christmas and decorate a whole room with such decorations, and it sure was fun. Thanks Corinne! Wishing you a beautiful holiday season filled with special family times! Have fun with it Cori! And have fun with your daughters no matter what! I hear you about the ice Tanya. Minnesota has a lot of it for sure! We have been there for Christmas a few times and it literally takes you breath away at 20 below! Enjoy your weekend Tanya! Thanks Adrienne. You can definitely do this! They are a lot of fun to make and add a lot of beauty for just a little effort. Inexpensive but elegant! My kind of craft! Hope you have a weekend with time for a little relaxation! I love them too. It’s actually pretty easy to make these. But warmer weather in fall is maybe the best time for the spray painting. Enjoy your weekend, Shannon! Glad to bring back memories, Susan! When I was a girl we had favorite book, “The Twelve Dancing Prinesses.” The princesses escaped the castle every night to go dancing. The path to the boats that took them to the island of the castle where they danced was very special. The path was lined with trees with branches of silver, gold, diamonds, and emeralds. On one of their trips the prince who followed them broke off a branch of a silver tree as proof to show their father the king. These kind of remind me of that fairy tale! So simple, yet so beautiful! Thank you for sharing Maggie! Maggie you are so crafty girl. I love these ideas. I’m going to show it to my daughters and see if they want to try these. We’re making our wreathes tomorrow so we’ll be at the crafts store anyway. Love all these pics….looks so pretty! Thanks for sharing this! Have a great weekend! I love the snowy, glittery sheen. So beautiful. It reminds me of home. I’m originally from Minnesota and while ice is a huge pain – I admit when the trees were covered with in ice – it looked great, although it wasn’t very good for them! My Mom has similar decorations and I love them. Can’t wait to get home and see them! Have a great weekend! Those are really great ideas Maggie and something I could definitely do. Of course finding the time is not only locate the stuff I need but do the actual projects will be my downfall. But, I’m going to keep this in mind for maybe next year and try to work this in. I’m ready for something different in this house. Thanks and have a wonderful weekend. Looks beautiful and elegant. I wish I was more crafty! Have a great weekend, Maggie. These look beautiful, Maggie – when I was a kid, my Mum used to spray a branch with silver and decorate it, so you’ve really brought back some happy memories with this post.